When I first saw this tweet I laughed to myself about how unfit I am.. But then I thought about it and I realised that actually I do walk 2 miles to school and home from school 5 times a week. On top of that I am constantly running upstairs and from one side of the school to another, so I do a lot of walking! I guess it helps when keeping fit because I am also a very fast walker. All my friends are constantly telling me to slow down. I guess with confidence about my body I have learnt that everyone is different and we are all special in our own ways. We just have to embrace our flaws and learn to treat them as something special, because not everyone has the same as me. 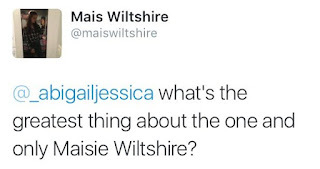 Maisie Maisie Maisie... the greatest thing about Maisie Wiltshire is that she has amazing taste in friends obviously (have you seen how fab I am gosh!). Of course you have great taste in books. 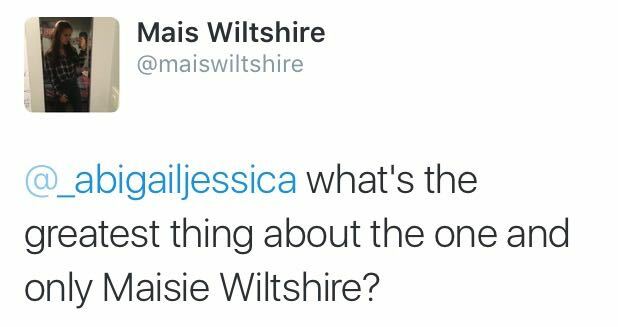 Anyway... Maisie was new in my year at school and I didn't know her at first. Then the other day she DM'd me on twitter and we started to chat and I learnt how funny and kind she is. I speak to Maisie 24/7 now and it just shows how the internet can bring people together! Because I am rather strange I love spending time with my family when everyone is happy. I feel like it is such a special day when you have a caring family around. Oh and also all the Christmas films, mince pies, Christmas pudding and MULLED WINE (non-alcoholic of course!). I was saying to my mum the other day that I would love to go to Norway and see the northern lights. I think that it would be a truly magical trip. It would be so breathtakingly aesthetic (using my descriptive language from my English course work!). One day I’d defiantly like to go. One beauty product that I love at the minute would have to be Mac's Matte Lipstick in the shade Velvet Teddy. I picked this up back in October when in Florida after my friend Olivia recommended it. The colour suits anybody. It is a subtle brown/purple colour that is stunning. I love to wear it with a golden brown Smokey eye! My favourite film is either Miss Congeniality or Big Hero Six. I love them both for completely different reasons! I love Baymax in Big hero six he is such a hilarious character that I would love to have in my life. I bet he gives good hugs. Also the fact he turns into a heater sounds great in this horrible English weather we have. But then again I love the whole concept of Miss Congeniality were she is a tom-boy cop whose life is turned upside down when she is entered into a pageant to solve a mystery. This question I was um-ing and arr-ing the answer to. I did Blogmas last year and I was actually quite proud of it not going to lie! This year I was thinking of doing a blog post every day but a chatty one on the first and then alternating days between opening a door on my benefit calendar and sharing with you what’s inside? 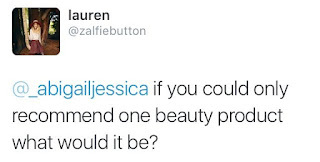 I thought that this would be a good idea for those who don't have a beauty calendar and are considering it next year and also to see more benefit products! I hope you enjoyed this blogpost! 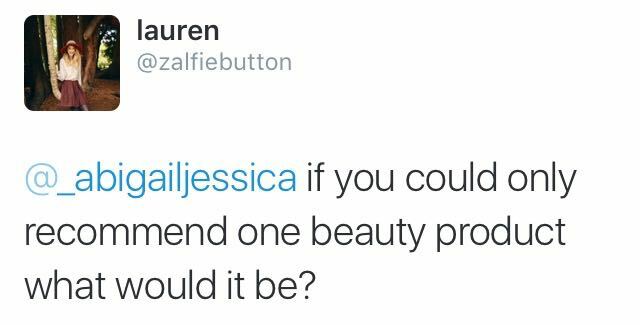 If you could only use one make-up product for the rest of your life which would it be? 1. Post a link back to the blogger who nominated you. 2. Answer the 10 questions that the person who nominated gave you. 3. 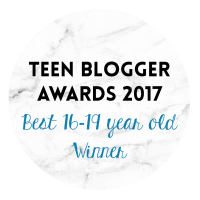 Nominate 10 bloggers (or blogs). 4. Give your nominees a set of 10 new questions for them to answer. 5. 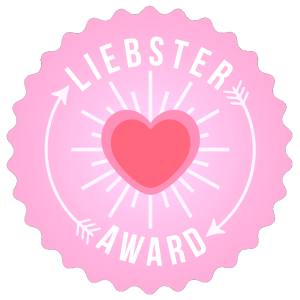 Also don't forget to include the Liebster award sticker in your post. My favourite animal is a cat. I have loved cats since I was a little human. I have grown up with cats and love them dearly. My current cat is called Monty and he is so fluffy and adorable. He is now four years old but still acts like a little kitten every day. 2. What is your favourite place that you have visited? My favourite place that I have visited has to be Disneyland Orlando. Disneyland is so magical and holds so many memories for me. I first went when I was little then again when I was around 10 and then again this year. Every single time, no matter how old I have been, I have loved it. 3. What is your favourite song at the minute? If you ever read my first ever blog post then you will know that I love One Direction. On Friday the 13th of November they released their new album Made in the am. I love the song Love you Goodbye however if I choose of the charts then it would be History by One Direction. The song was written for the fans about the fans. It is such an incredible song and I am constantly having it on repeat! My male celebrity crush is Louis Tomlinson. I think he is so incredibly amazing and has such a perfect singing voice. Not only that but I also think he is so aesthetically pleasing to look at. My female crush would have to be Blake Lively. I do not understand how people can dislike her. She is such an inspirational actress and she is so beautiful. I love being able to be myself without someone turning round and telling me I’m wrong. I like the freedom and creativity that I have. I have a bad habit of biting my nails. I really want to break the habit because then I can paint them and then they will look pretty! I love to sit in my bed with the candles burning and reading a book! My favourite smell has to be warm cinnamon donuts, when they are straight out of the oven. If it was a natural smell I would pick just after the rain has stopped falling. 9. What is your favourite social networking site? 10. Have you ever met a celebrity? If not, who would you like to meet? 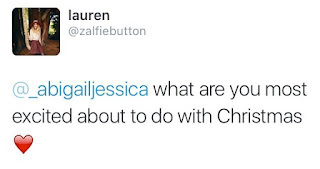 If you class him as a celebrity then Alfie Deyes (you can read my blog post about it here although it isn't the best because I wrote it over a year ago!) , but if not then I would love to meet Louis Tomlinson or the whole of One Direction! 1. What is something new that you have tried/done recently and you loved? 2. Favourite place to go and have your own time? 3. When you were younger what did you aspire to be when you're older. 4. What is the best book that you have read this year and why? 5. What is one thing that you love about yourself? 6. If you weren't a human, then what animal would you be? 7. Have you ever saved someone's life before/had your life saved... explain! 8. If you were stuck in an elevator with a celebrity who would it be and why? 9. Who is your main inspiration in day to day life? Thank you to Caihome once again for nominating me, I hope you have all learned something you didn't already know!